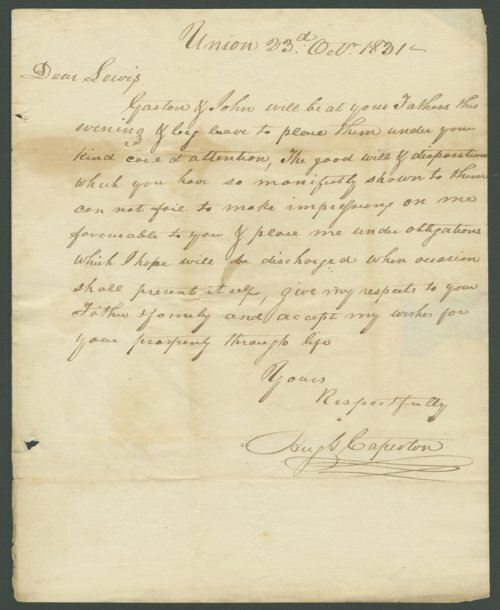 A letter addressed to Lewis Allen Alderson from Virginia congressman Hugh Caperton, who thanks Alderson for the hospitality shown by his father. Both Alderson and Caperton were from Greenbrier County, Virginia (now West Virginia). Alderson later moved to Atchison, Kansas in 1858 and was a prominent Baptist minister. He died in Atchison in 1881.